I would like to introduce myself, my name is Chris Ivy the owner of Town and Country Property Inspections based in Graves county KY. (Fulton..Mayfield area..) As many of my clients and or their agents meet me for the first time at or after the inspection, I like to provide a little background information about myself. I am a Kentucky native, and graduated Graves County H.S . I have been a small business owner since 1988 owned several businesses which include owning and operating Ivy Rentals when before becoming a licensed home inspector, owned, maintained and managed 35 properties for myself doing the majority of the work as well. I also had a buy and sell business where I bought, remodeled and sold approximately 25 properties. As a home inspector I enjoy meeting and talking with clients, investigating and reporting on the condition of homes, and providing clients with the information that they need to make an informed purchase decision. As a home inspector I feel it is my obligation to provide the customer with the most comprehensive and easy to read report. I am a non-alarmist inspector. I know that there are problems in all houses new or old, it is how you present them to your client that is important. My job is to help your client know the overall condition of the house and how to help solve problems that may arise. It may surprise many of you who read this to find out that there is no licensing for home inspectors in many areas. Because it is unregulated there are many "home inspectors" out there that simply have a clip board and a pick-up truck. I want more than that for you as my client. As I stated before, a home inspection is a very important protection for you and your family. Knowing this, I go the extra mile and I belong to InterNACHI, the world's largest home inspector association. 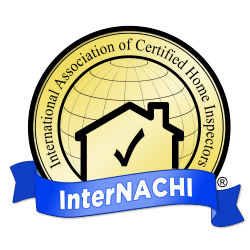 With hundreds of hours of courses, a strict code of wthics, and some of the bet home inspection continuing education in the world InterNACHI home inspectors are the best of the best! Whether you are buying or selling a home, you should always enlist the services of an InterNACHI Certified Home Inspector such as myself. Contact me today to ensure that you are receiving a full, thorough, and honest home inspection!